On 2 November, Microsoft announce Microsoft Teams – a new chat-based tool for Office 365. Intended as a collaboration tool, it brings together people, conversations and content. Microsoft Teams was built in response to the changing workspace. More and more, companies are moving online and collaboration occurs over the Internet. Often, users no longer need to meet up in person to get work done. Microsoft Teams enables this online collaboration to take place in a manner that is consistent with the software your business already uses. Users are able to collaborate through threated conversations, or through voice and video conference. Organisations can organise themselves into channels – for example with each department or project – or in private groups. By default, conversations are visible to the entire channel, but there is – of course – availability for private discussion. The service archives conversations, so if you miss a conversation or a day of work you can get up to speed with changes once you’re back. With integration with Office 365, users have access to the full breadth of Windows applications so that all the information you need is at your fingertips – Word, Excel, PowerPoint, SharePoint, OneNote, Planner, Power BI and Delve. In many ways, Microsoft Team is not anything new. It uses many of the existing strengths of Office 365, Skype, and Exchange. Many will find the interface familiar and easy to use. Many of the features will also be familiar to users, including pictures, GIFs, and emojis. The main benefit is not in the innovation, but in the integration. 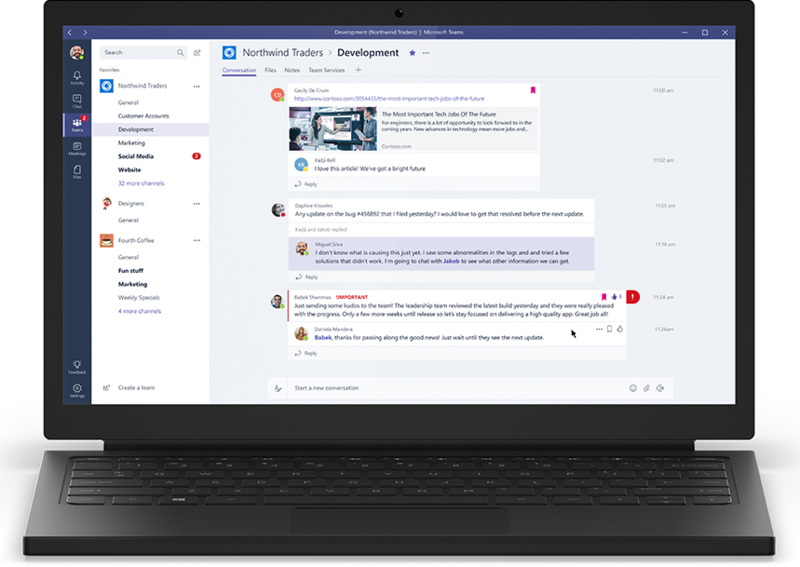 Where previously teams were required to converse over email and keep track of email chains, or use third party applications to have their conversations, Microsoft Teams is embedded within the applications you use on a day-to-day basis. Channels can be customised to meet your needs. Through a feature called Tabs, users can provide quick access to frequently used documents and applications, making collaboration even easier. Microsoft Team is free for commercial Office 365 users. Having access to this product won’t cost you anything additional. Speak to your company’s IT department or IT support provider about whether or not to deploy it to users in your organisation. Microsoft Teams is available on all major platforms. Whether your organisation uses Windows 10, Mac, Android, iOS, and more, you can use Teams. In true Microsoft style, they have opened Teams up to developers already. Why? Because developers can often leverage and extend Microsoft software to better suit your business or industry. Microsoft aims to assist organisations wherever possible, including allowing developers access.